Attendees edit Wiki content at the LuEsther T. Mertz Library of the New York Botanical Garden. Photo by Marlon Co.
Wiki projects, including Wikipedia, Wikimedia Commons, and Wikidata, contain the information that powers the web. Wikipedia is the fifth most-visited website in the world. 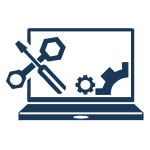 To edit a Wiki project is to contribute content that could potentially be viewed by thousands or even millions of people over time, both on Wiki sites and on sites like Google and Facebook, which harvest data, including media, from Wiki sites. Like Wiki editors, BHL contributors are passionate about having their content accessible to and used by the most people possible. 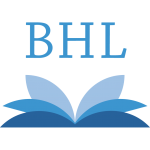 The information that we provide through BHL is intended for global audiences. We hope that the special things and unique data in our collections have a life beyond our walls and our institutions. This similarity in missions and goals is what makes projects involving both BHL and Wiki* a great fit. 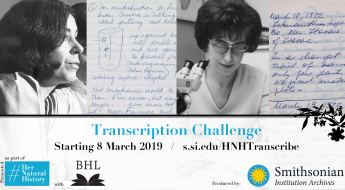 To this end, for the #HerNaturalHistory campaign, the LuEsther T. Mertz Library of the New York Botanical Garden and the Smithsonian Libraries held three crowd-sourcing citizen science/citizen humanities events in March of 2019. These events were intended to bring new editors to Wiki projects, have editors add information about female scientists to Wikipedia, and have editors add information to BHL collections on Flickr and in Wikimedia Commons utilizing the Wikidata knowledge base/database/catalog. 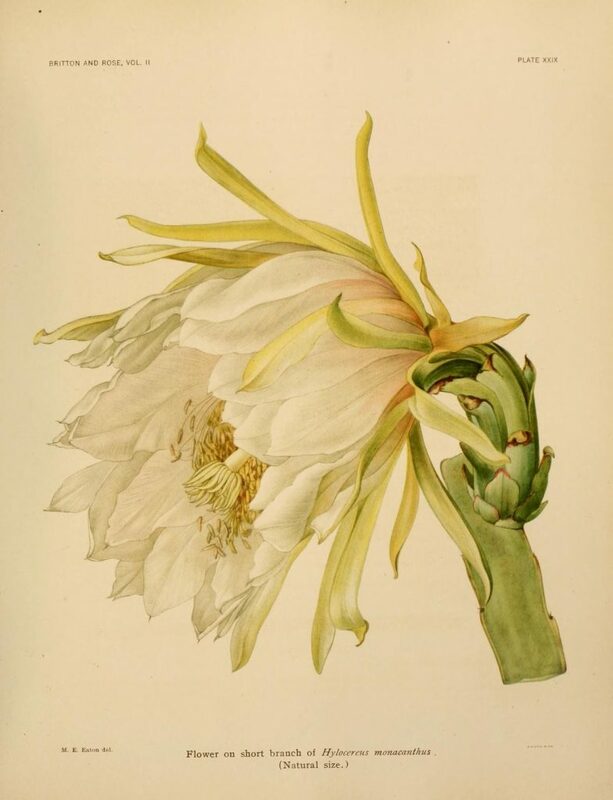 Illustration of Hylocereus monacanthus by Mary Eaton, The Cactaceae, . Contributed in BHL from The New York Botanical Garden. 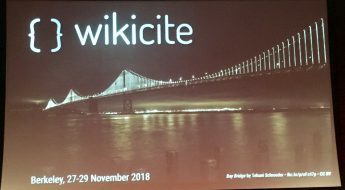 At the New York Botanical Garden on 12 and 13 March, attendees had the opportunity to add data to images in Flickr, add data and categories for images in Wikimedia Commons, and add data to items in Wikidata. 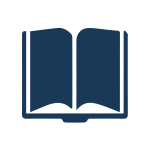 (The task list can be found here.) Over the span of two days, attendees edited 22 files on Flickr, adding 84 taxonomy:binomial and 34 taxonomy:common machine tags. 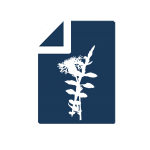 206 edits were made to Wikimedia Commons files, categories, and other content, adding 16,748 bytes of data and five new images to the repository. On Wikidata, four new items were created and 24 items were edited 114 times, for a total of 30,700 bytes added. 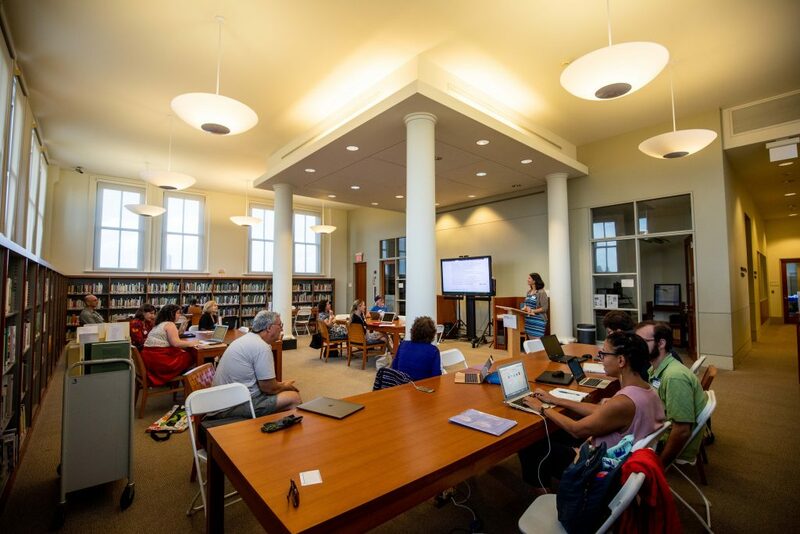 The event was offered in collaboration with Wikimedia NYC, the regional Wikimedia chapter serving the New York metropolitan area. WM NYC promotes free access to the world’s knowledge and supports Wiki projects in the greater New York City region; the attendance of WM NYC members provided the other attendees with a great deal of expertise on the finer points of Wiki projects and editing. 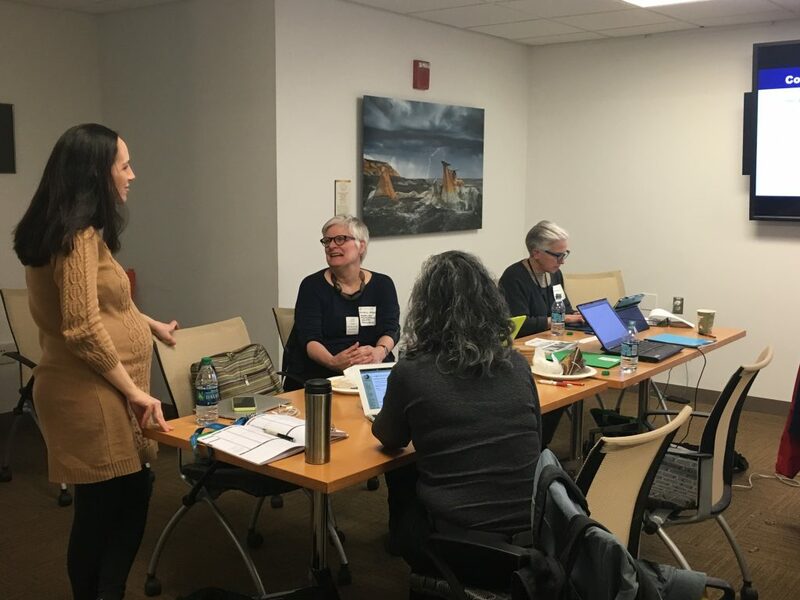 During the Smithsonian Libraries Workshop on 13 March, in-person participants at the Natural History Museum Library and virtual participants from around the world focused on editing the Wikipedia pages of female contributors to natural history using resources from BHL. Attendees focused their edits on women included in the Workshop’s Suggested Article Work List, comprised of over 100 women represented in the BHL collection. 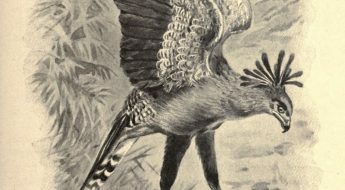 The Work List was compiled based on research and suggestions predominantly from BHL citizen scientists Michelle Marshall and Siobhan Leachman, as well as colleagues from the New York Botanical Garden, Smithsonian Institution Archives, and the BHL Cataloging Group. Attendees editing at the Smithsonian Libraries Wikipedia Editing Workshop, hosted in the Natural History Museum Library and sponsored by Wikimedia DC. Photo by Grace Costantino. The Smithsonian Libraries Workshop was sponsored by Wikimedia DC, with representative Ariel Cetrone facilitating the meeting. Two other representatives from Wikimedia DC, Jim Hayes and Andrew Lih, were also in attendance to provide support to participants. To facilitate virtual attendance, the Workshop was live-streamed via YouTube Live. A copy of the presentation used during the Workshop is also available online. In total, over 70 people attended the Smithsonian Libraries Workshop, representing 20 in-person and over 50 virtual attendees. All told, as a result of the Workshop, 50 articles were edited, 5 new articles were created, and 14 images were uploaded to Wikimedia Commons, representing a total of 140 edits. Additionally, 36 new “editors” (first-time Wikipedia editors) participated in the Workshop. The Suggested Work List will remain active indefinitely, and we welcome anyone to continue editing the Wikipedia pages for these women. Although metrics are important, and offer a glimpse into one aspect of these events, the more impactful takeaways from these collaborations were the discussions that attendees had on topics ranging from open content, to information architecture, data storage, content curation, and more. In a sense, these crowd-sourcing edit-a-thons were a salon of sorts, where curious people who are passionate about open information were able to discuss strategies for how to make data more accessible and useful to the public, and work together to find and implement these solutions. Esther Jackson is the Public Services Librarian at the New York Botanical Garden. She is on the Wikimedia NYC Board of Directors, a Chapter Leader for Girl Develop It NYC, and the organizer of Code4Lib NYC.